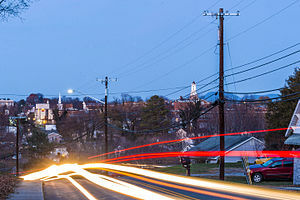 The town of Bedford on a typical fall evening. 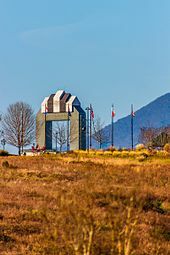 Bedford is an incorporated town and former independent city located within Bedford County in the U.S. state of Virginia. It serves as the county seat of Bedford County. As of the 2010 census, the population was 6,222. It is part of the Lynchburg Metropolitan Statistical Area. Known as the "place that sells itself," Bedford boasts the Blue Ridge Mountains to the North, Smith Mountain Lake to the South, Lynchburg to the East, and I-81/Roanoke to the West. Bedford was originally known as Liberty, "named after the Colonial victory over Cornwallis at Yorktown." Founded as a village in 1782, Liberty became Bedford County's seat of government, replacing New London which had become part of the newly formed Campbell County. Liberty became a town in 1839 and in 1890 changed its name to Bedford City. In 1912 Bedford reverted to town status, it resumed city status in 1968, and once more it reverted to a town in 2013. Bedford was designated as an independent city in 1968, but remained the county seat of Bedford County. Its status as an independent city was ended on July 1, 2013, returning to a town within Bedford County. Bedford sits at the feet of the Peaks of Otter. As of the census of 2000, there were 6,299 people, 2,519 households, and 1,592 families residing in the city. The population density was 914.5 persons per square mile (353.0/km²). There were 2,702 housing units at an average density of 392.3 per square mile (151.4/km²). The racial makeup of the city was 75.33% White, 22.38% Black or African American, 0.24% Native American, 0.57% Asian, 0.08% Pacific Islander, 0.24% from other races, and 1.16% from two or more races. Hispanic or Latino of any race were 0.89% of the population. There were 2,519 households out of which 27.7% had children under the age of 18 living with them, 43.0% were married couples living together, 17.2% had a female householder with no husband present, and 36.8% were non-families. 33.0% of all households were made up of individuals and 15.7% had someone living alone who was 65 years of age or older. The average household size was 2.26 and the average family size was 2.87. In the city the population was spread out with 21.6% under the age of 18, 7.2% from 18 to 24, 27.8% from 25 to 44, 20.7% from 45 to 64, and 22.6% who were 65 years of age or older. The median age was 41 years. For every 100 females, there were 90.6 males. For every 100 females age 18 and over, there were 85.4 males. The median income for a household in the city was $29,792, and the median income for a family was $35,023. Males had a median income of $31,668 versus $18,065 for females. The per capita income for the city was $15,423. About 11.4% of families and 12.7% of the population were below the poverty line, including 19.4% of those under age 18 and 11.1% of those age 65 or over. The cupola atop the Bedford County Court House was built in 1866. Bedford is served by Bedford County Public Schools, which operates Liberty High School and Liberty Middle School in the community. Fifteen elementary schools feed students into these and two other pairs of middle and high schools elsewhere in the county. Central Virginia Community College also has a branch campus in Bedford. The climate in this area is characterized by mild, humid summers and generally mild to cool winters. According to the Köppen Climate Classification system, Bedford has a humid subtropical climate, abbreviated "Cfa" on climate maps. U.S. Route 221 runs through the town; and U.S. Route 460 circumvents the main part of town. State routes 43 and 122 converge onto the town. Until the late 1960s there were three different Southern Railway/Norfolk & Western Railroad trains operating daily at Bedford station. However, the newly restored Amtrak service to Roanoke does not make stops at Bedford. Ivybridge, Devon, England (signed in 2004). Bedford maintains relationships with 11 communities on the Normandy Coast of France. One sister city, Trévières, France, sent Bedford an exact replica of its own World War I memorial statue. The face of the statue was damaged in World War II by artillery fire from US forces retaking the town. The Bedford statue also bears these wounds and is erected on the grounds of the National D-Day Memorial. Lawrence Chambers, the first African American to command a U.S. Navy aircraft carrier and the first African American graduate of the Naval Academy to reach flag rank. ^ Bedford County Sheriff's Office, Welcome to Bedford County! ^ Goldstein, Richard (23 April 2009). "Ray Nance, Last of the Bedford Boys, Dies at 94". The New York Times. ^ "Home - Bedford County Public Schools". bedford.sharpschool.net. Retrieved 2016-09-25. ^ Catherine Reef (1 January 2004). African Americans in the Military. Infobase Publishing. pp. 56–7. ISBN 978-1-4381-0775-2. Retrieved 3 November 2016. Wikimedia Commons has media related to Bedford, Virginia. Wikivoyage has a travel guide for Bedford (Virginia). This page was last edited on 31 March 2019, at 02:36 (UTC).